Welcome to the inaugural post of How to Cook Water! This idea has been an adventurous year in the making. For as long as I can remember, I've always enjoyed cooking. Years ago I was between careers and took a position in a gourmet cookbook store; one of my jobs was to read cookbooks and test the recipes in them. I loved every minute of it, and I became a total cookbook addict. My collection is borderline ridiculous; my husband is very patient with my habit but hey, at least he's well fed...he doesn't suffer too much! Now, even though my formal career is that of illustrator and painter, my love for cooking is still as strong as ever. I'm often asked for tips on how to cook simple, fresh food, both from friends who are great cooks themselves and friends who claim they can't boil water...and this is the way How to Cook Water was born. 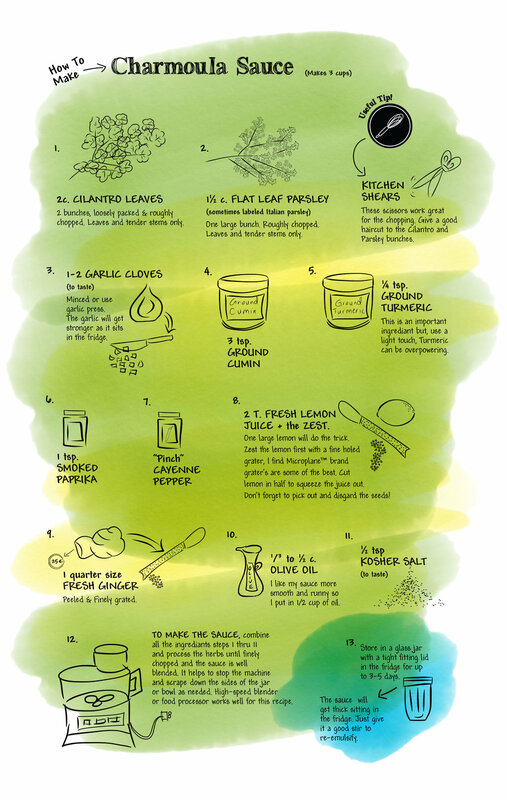 The recipes in this blog will be explained in step-by-step illustrations created by yours truly. The recipes will be some of my own and some that are adapted from cookbooks, blogs and great chefs. The recipes will be fresh, whole food recipes that will satisfy everyone, from the biggest carnivore to the greenest of veg-heads. So with that, let's get started! In my book, salad dressing should not come in a bottle from the store. This might make me a bit of a dressing snob but so be it; fresh salad dressing is easy to make and is waaay tastier than store bought. Trust me on this. I picked three dressings for this post: Green Salad Vinaigrette, Carrot Ginger Dressing, and Charmoula sauce. 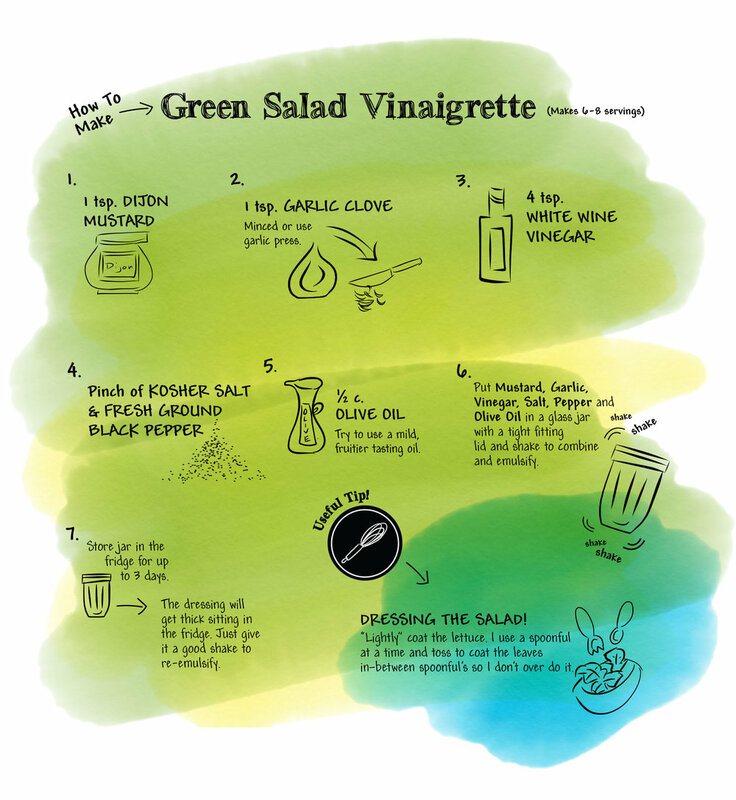 The first is Green Salad Vinaigrette. I've been making this for years; it's a good one to have on hand and goes great with just about everything. I sometimes serve this with fresh shaved Parmesan; a good cheddar sprinkled on the salad is also a nice twist to try. I also brush this on bread for a nice base instead of butter for garlic toast. Throw all the ingredients in a reusable jar, shake it up and your good to go. 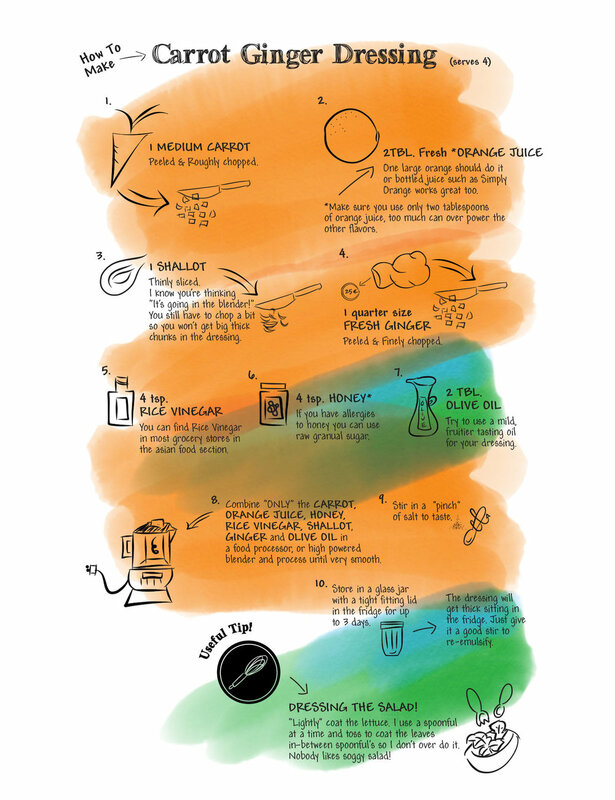 The second one, Carrot Ginger Dressing, is adapted from Rozanne Gold's Radically Simple. It's bright and fresh with the flavors of orange and ginger, and has an Asian flare that goes great with fish and poultry dishes. I use my high powered blender for this dressing and it did the job nicely. The third recipe is not necessarily a dressing but more of a sauce, that's sure to become a staple in your fridge. It goes great with grilled meats, fish, roasted and raw veggies...meet Charmoula sauce! This one comes from founder of TheKichn.com Sara Kate Gillingham-Ryan, this Charmoula recipe is the best one out there in my opinion. I do add more olive oil than the recipe calls for because I like my Charmoula more "saucy" consistency, but it's up to you. Sara Kate did a cookbook a few years ago for Williams-Sonoma called Good Food to Share; it's a gem of a book, and even though I think it's out of print, you can still find copies of it floating around on the internet. A high-speed blender or food processor works well for this recipe. Please read the recipes all the way through before making them. I've made this mistake too many times and it's always a bummer when I have to start all over because I missed some simple direction.